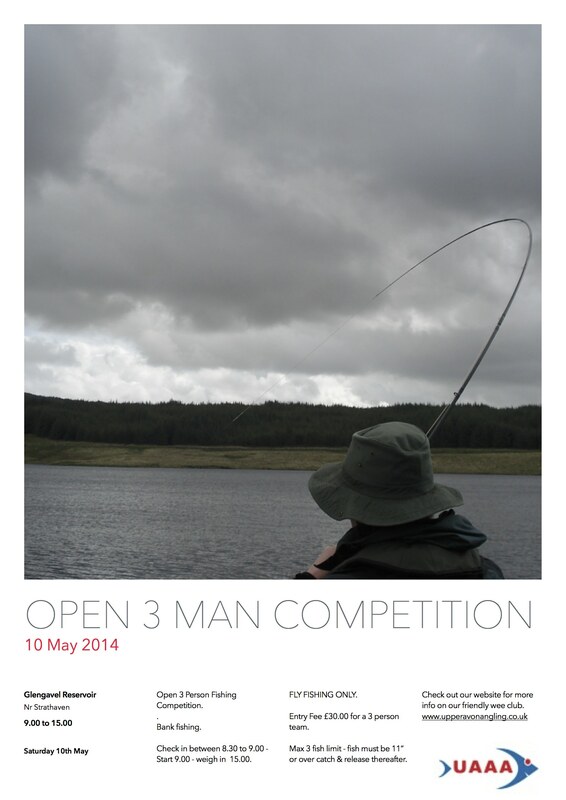 We are keen to announce our “Open 3 Person Team Competition” on Saturday the 10th of May – cost per Team is £30.00 we are delighted to announce that we have a whole range of great prizes – if you want to take part please email your entry to upperavonangling [at] gmail [dot] com please supply Team Name & entrants names? Don’t worry though if it has to be arranged at the last minute – you can alway turn up on the day & book in – even if you are on your own we will find you a place in a team or you can just choose to fish as an individual for the individual prize. Please note – details now available on our fishing competition on Saturday the 10th of May at Glengavel Reservoir – Fly Fishing only – 3 person team – entry fee £30.00 for 3 person team – check in 8.30 to 9.00 – start 9.00 – weigh in 15.00 – max 3 fish limit each catch & release after limit – see poster below – there is also a download version which is available at the bottom of the page.